Sigh. I have pretty much resigned myself to the fact that now that I am home schooling, blogging is going to be relegated (is that a real word?) to a weekend activity. However, I've been meaning to post these photos of our new "classroom" for a week, now. The baseboard is still not on, but other than that, it looks great! 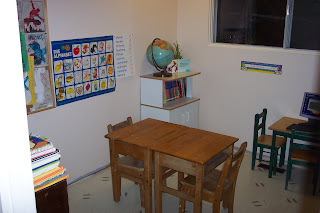 And I love having everything in one room--learning tools, craft and art supplies, and desks! The kids love it, too. 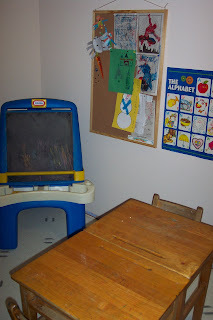 They often go in there as soon as they wake up and start doing puzzles and colouring. So cool. View from the door. 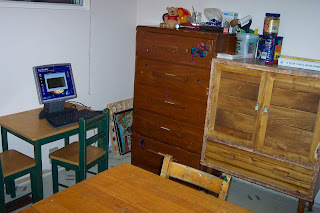 The desks were about a $10-each purchase at a garage sale this summer. The globe was a gift from my grandmother--it has the USSR on it, but it'll work for now. To the left of the the door. The chalkboard was a gift from my friend Vicki. The right side of the room. The "computer" is actually a glorified calculator--the mouse doesn't work worth beans, really, but it's got some great learning games on it for kids. The dresser on the left is full of art supplies, colouring books, puzzles, and games (and now sports nifty little labels on the drawers.) The dresser on the right has the majority of Jabin's clothes in it. 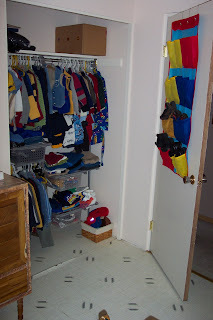 This is still where the boys' clothes are stored. (They now all sleep in what used to be Jabin's room, but this was Jude's and Noah's room before.) I went and got the nifty modular Extendit closet organizer system from Canadian Tire, and just look how much is crammed so neatly into this closet, now! My melancholic soul thrilled at the frenzy of organization. It's still organized, too, amazingly enough! I said I would explain why Jude is now home schooling, so here goes. One of the main reasons we decided to put him into school this year, instead of home schooling him from the get-go, was to help him learn to focus in a large group setting, and to help him to gain confidence in new situations, meeting new friends, etc. Unfortunately, when we had his parent/teacher interview a week before we left on holidays, we found out from his teacher that he was still not adjusting well to kindergarten--he would often be teary at school (I imagine in frustration), did not participate well in group activities like singing, etc., and was always trying to figure out what would be "next." He is the type of kid that likes to be feel like he knows what's going on, so being ushered from one activity to the next at school was disconcerting for him. Besides this, he had been telling us almost daily since about two weeks in that he didn't like school, and didn't want to go. After the interview, we finally got him to tell us that it was partly because he didn't feel like he had any friends in his class, and no one would play with him at recess. We encouraged him to ask a couple of other little boys that he was acquainted with and liked to play with him, which he finally did. It seemed to help, but there were still the other issues to deal with. Jude is young for kindergarten, having just turned 5 in November. The sudden switch to early mornings and a schedule 5 days a week was a little much for him, I think. We decided to home school him for the remainder of this year (something his teacher agreed was a good idea), and re-assess where we are at come summer. 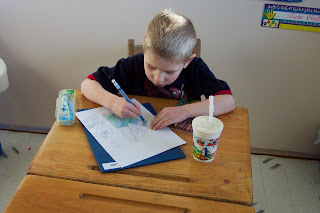 I may just continue to home school him into grade one from there, as I was planning to do until about grade 3 with each of our kids, anyway, or we may have him repeat kindergarten this fall. Time, and his maturity level, will tell. Jude was drawing a "water park" here. On the side is a picture of a plate of pancakes, a glass of chocolate milk, and a kid and a dad. He gave the completed picture to Josiah and Micah Steinke, who visited us later that day. 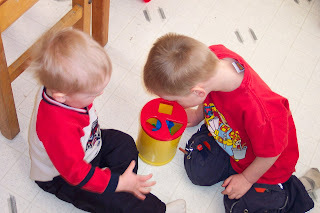 Noah and Jabin work on their shapes (without knowing it.) Noah is actually quite good at shapes, so he was helping Jabin find the right holes for all the blocks. For now, I have been loving the home schooling--it is actually easier, in some ways, because instead of going crazy all morning with little boys fighting with each other out of sheer boredom, or driving me to distraction with questions of "What can we do?! ", the whole morning is planned out. The afternoon is when I get my own stuff done, and they get a little more free time to play. And now that I am getting the hang of it, the lesson planning is getting shorter every night. It's been fun to bend my creative brain around fun ways to impart the information we need to cover. Plus, Jude is still technically enrolled at his school, so we are going to participate in field trips and special class days. Tomorrow morning we are going on a field trip to the hospital. Other than the zoo of getting all the kids out the door early again, I'm actually looking forward to it! Your "classroom" looks terrific Talena! We would love to come learn with you guys there! And great that Jude can still be connected with his little friends thru school activities. Go girl! My hats off to ya! I echo Dawn - your classroom looks great! It sounds like the whole process for you has been encouraging and really, that's wonderful! Such large decisions to be made, hey? I'm glad you're enjoying it so much. YAY! Dawn - Thanks! 'Twould be great to have you anytime! :-) Jude had a lot of fun at the hospital. He was so cute, giving his teacher hugs and everything.